Cuts of beef can be confusing, given that names vary slightly based on minor modifications. A ribeye roast—also known as prime rib—turns into ribeye steaks when it's sliced. A ribeye filet is the same as ribeye steak but with the cap removed. What doesn't change, however, is the taste of that cut of beef. A ribeye steak, also known as a Delmonico steak or filet of ribeye, comes from the rib portion of the cow, and it's rich, tender and juicy with plenty of marbling throughout, no matter what you call it. 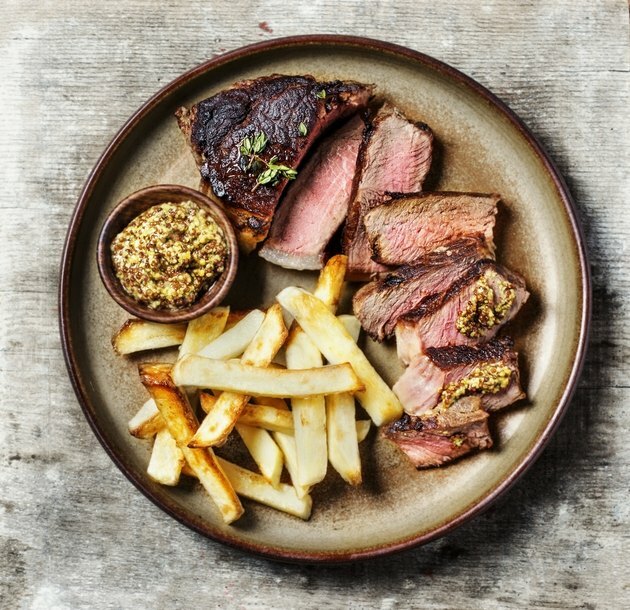 The most common way to cook a ribeye steak is to grill or saute it to medium-rare, preserving the tender juiciness that the marbling of the steak provides. Pressure-cooking is best-suited for a large, tougher piece of beef that's not naturally as tender. The high pressure that the steam creates into the pressure cooker breaks down the tough fibers of these cuts, allowing them to taste like they've been slow-cooked, simmered or braised for hours. 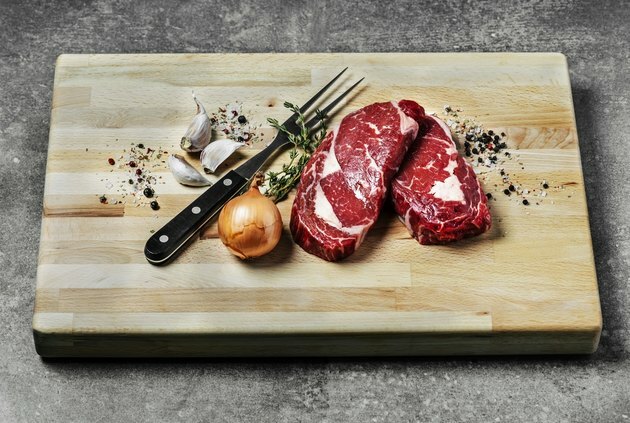 Ideal cuts of meat for pressure-cooking include chuck roast, beef ribs and oxtail. Here's how the pressure cooker works: The liquid within a sealed, airtight pot builds up pressure, which raises the boiling pot of the water. The higher temperature of the liquid not only cooks the food faster but also forces moisture into the food, which allows it to become tender much more quickly than with other cooking methods. Read More: Does Pressure Cooking Meat Make It Tender? However, pressure cooking doesn't allow for cooking foods to various degrees of doneness, like a grill or saute pan would. Therefore, if you want to cook a ribeye steak in the pressure cooker, be prepared for a well-done piece of meat. These same directions can be used for a steak or for a larger piece of beef, such as a roast. Step 1: If you have an electric pressure cooker that also has a saute function or if you're using a stovetop cooker that is placed directly on the burner, pour a tablespoon of olive oil into the pot and turn it on to heat. If your electric cooker does not have a saute function, add the oil to a nonstick skillet over medium-high heat on the stove. Step 2: While the pressure cooker or skillet is heating, sprinkle both sides of the steak with salt and pepper. Add the steaks to the oil and sear the beef on both sides. Step 3: Add 1 cup of liquid to the pot of the pressure cooker. Put the lid on, seal the pot and set the cooker for 20 minutes per pound of steak. Step 4: Release the pressure from the cooker, according to the specific directions of your model, and remove the meat. If desired, turn the pot back to saute or drain the liquid into a saucepan and turn the heat up to high to reduce the liquid for an easy sauce. A long time ago, pressure cookers were at risk of exploding because of a lack of built-in safety features. 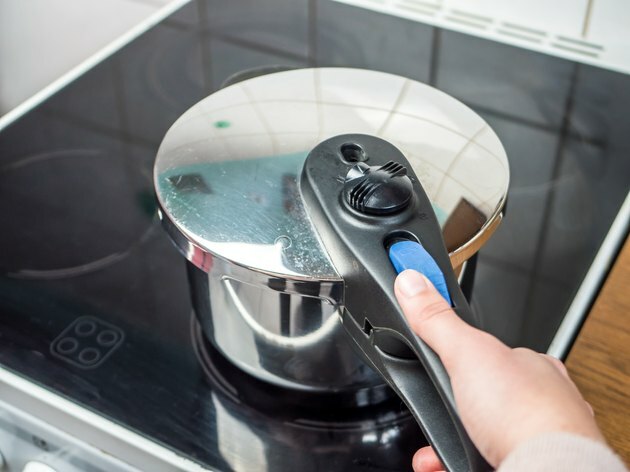 That's no longer the case—modern-day pressure cookings have a wide range of ways to prevent any sort of danger, such as automatic pressure control and heating sensors. However, you should still keep your wits about you while using a pressure cooker, just like you would with any other form of high-heat cooking. Make sure the lid is properly in place and locked before setting the pressure. * Do not attempt to open the pressure cooker until it's been depressurized. * Keep your hands and other body parts away from the valve when releasing the pressure—the steam is incredibly hot. Does Pressure Cooking Meat Make It Tender?